This tandem is termed a lady-front, as the front step-through section of the frame is designed for a woman and the back section of the frame is suitable for a man. The handlebars are almost flat and swept back (North Road style), and the steering is coupled by rods fixed to the base of each steering tube. The frame is finished in black paint with gold lining. The wheels have tangential spokes and pneumatic tyres. There is a front cable brake on the 28 inch front wheel. The back wheel is slightly smaller at 26 inches diameter. The two sets of pedals drive the back wheel via a single chain. The pedals have rubber grips. The saddles are sprung and made of leather. 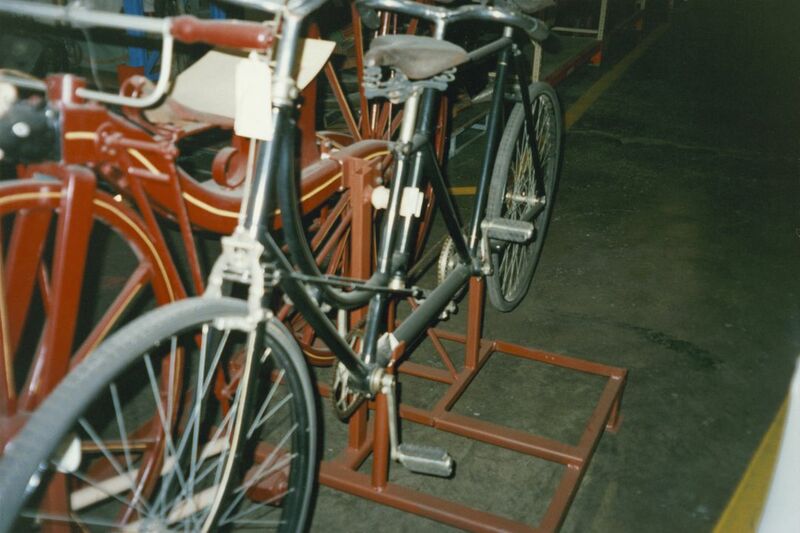 The bicycle was purchased with several others from collector Mr R Nash in 1954. The front brake, pedals, chain and saddles have been replaced at some stage.